Dino Stretch Hood, also the best solution for the white goods industry. Dino Stretch Hood is a compact machine free of pneumatic and hydraulic systems, significantly reducing the energy consumption. A decrease of 50% is the norm rather than the exception. 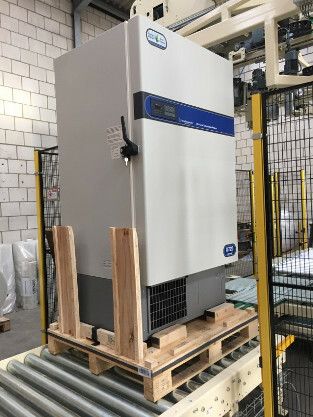 Robustly designed using only premium-quality components, the Dino Stretch Hood offers excellent reliability for the white goods industry, where companies work with high capacities. 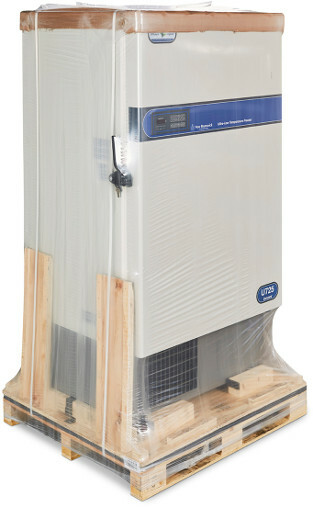 The film unit makes a stretch hood independently from packaging a pallet with the stretch unit. This ensures the Dino Stretch Hood operates very smoothly at high capacity. The standard Dino set-up can already process more than 120 pallets/hour. Is your product not among those listed? No problem. Simply contact us. Dino Stretch Hood is ideal for the white goods industry. Read the advantages here. Would you like to see with your own eyes why Dino Stretch Hood is the best possible choice for you? You can by testing your product with us. We’ll do a number of test runs with your product in a test set-up. Then, together with you, we’ll measure which type of film is most suitable and which configuration offers you the biggest savings. Want to know more or arrange a test?